A relationship website has released findings based on estimated affairs within each postcode. The most adulterous towns in the UK have been revealed - and the results may surprise you. Relationship website illicitencounters.com have compiled a list of the most unfaithful towns in their Infidelity List 2016, and Wycombe Abbey in Buckinghamshire has made it to the top spot. The results were collated from stats on the dating website which compared a town's estimated affairs with its population, and it looks like those from middle-class, suburban areas are the most unfaithful of us all. Wycombe Abbey won by a country mile, with a whopping 2119 estimated affairs last year in comparison to their population of 120,256. Guildford came in second place with 1250 affairs, and a reported 2.05% of their population apparently fancying a bit on the side. 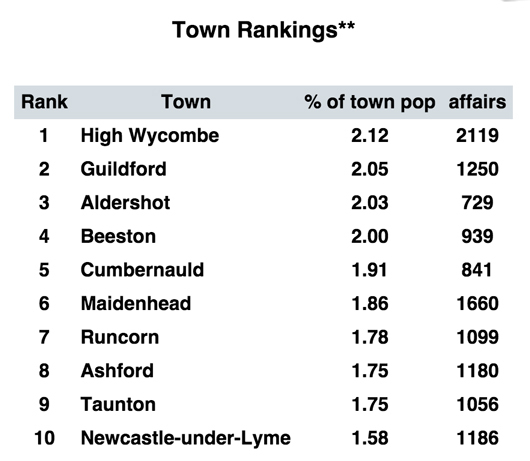 The list - which named and shamed 140 towns - saw Brentwood, Essex at the bottom of the rankings with only 98 estimated affairs. You can even plug in your postcode here to find out how "illicit" your town is.